Infrared transmitting (IRT) sheet was specifically formulated for projects requiring ultraviolet (UV) and visible light blockage while allowing infrared (IR) transmission starting about 750nm. The physical properties of this product are the same as standard extruded sheet and thus the same fabrication techniques apply. What makes this product special is its ability to transmit light in the IR region while still blocking UV. We stock this UV blockign acrylic in 0.080" and 0.118". Note: All plexiglass sheet is infrared transmitting. 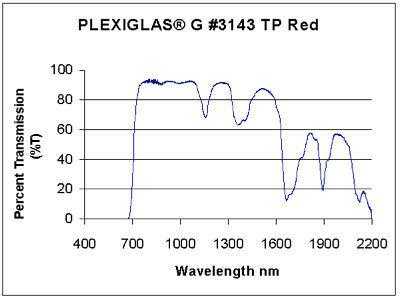 This grade is opaque to visible light and allows infrared light through. Unlike glass, you can put all grades of plexiglass in front of DVR's, cable boxes, DVD players, etc. and your remote control, wireless router, etc. will still work. This particular acrylic material is black and only transmits infrared, which makes it ideal for hiding a CCD video camera. This material is also available in injection molding pellets by special order. For high volume applications, we offer injection molding services for IRT projects. There are various types of infrared transmitting acrylic, including CYRO's ACRYLITE® IR acrylic 1146, and Plexiglas® IR acrylic 3143. The specifications are different for each, so please review each chart above. Also, specifications may vary slightly batch to batch. Please test your material when you receive it to ensure that it is appropriate for your application.